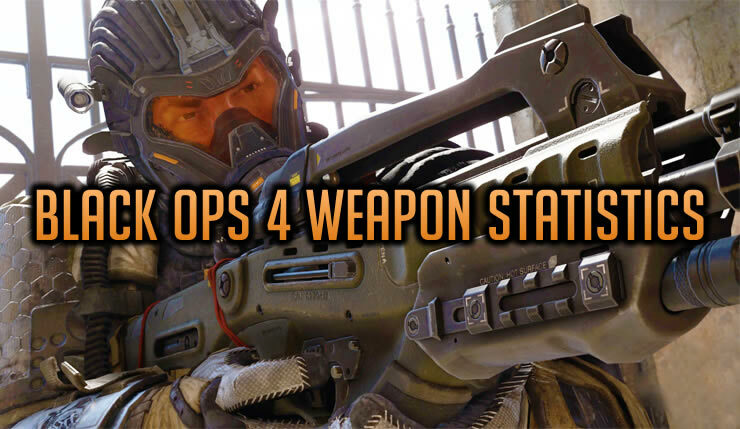 Call of Duty Black Ops 4 multiplayer has many different classes and weapons. Which weapon you use depends on your play style and the map. Each of the weapons have different rate of fire, time to kill, damage, magazine size and reload times. All of these factors go into deciding which weapon you would like to use. Take a look at the tables below and compare the weapon statistics, that way you know which weapon to use. Fastest time to kill assault rifle is the Rampart 17 with high caliber 2. Fastest rate of fire assault rifle is the VAPR-XMG at 712 rounds per minute. High rate of fire sub machine gun is also the SPITFIRE. AUGER DMR is the only 3 shot tactical rifle. SWORDFISH has the fastest time to kill, 0.27 seconds with rapid fire. VKM has almost as low of a time to kill as the SPITFIRE with high caliber 2 and rapid fire. No matter what the TITAN takes forever to reload. SDM has an insane rate of fire compared to traditional sniper rifles. Mozu is a vialble secondary and can be used to finish off kills if you have slight of hand and can switch over. Even with a higher time to kill the MOG 12 outperforms the SG12 because of range. These stats will be updated as data is collected. We will also try and update each time a patch comes out that effects the weapon stats.